A Special Place for Seniors and visitors! CHECK OUT OUR CONTESTS! John, Lily and the tree trunk. A young man finds himself stuck in a tree trunk and must rely on his girlfriend for help. Merit Badges are the perfect way to recognize another Writing.Com member for effort and excellence! Whether given out for the member's writing, reviewing, interactions or personality, a Merit Badge will be a lasting reminder of your sincere appreciation. Merit Badges are symbols of recognition that are given at will from one member to another. Each badge is custom-designed by Writing.Com to represent a particular trait, specialty skill or theme. Send a virtual badge that is kept and displayed in the member's portfolio; mail a physical one to the member to keep and display at home! How do I give a virtual Merit Badge? There are a few ways to give someone a Merit Badge. The quickest way is to click the member's handle and choose Badges from the drop down menu, then "Send a Merit Badge" from within the member's badge page. You can also click the Shop or Gift Points link from within the left navigation under the Writing.Com logo and choose Merit Badges. You may also click here: http://www.Writing.Com/main/badges. Simply choose the Merit Badge that best suits your reason for recognition and include a few comments of explanation. After the badge is given, the member will receive a detailed notification email, the badge will be added to the Merit Badge collection within his or her portfolio "Community" tab and also added to his or her Community Recognition. Each virtual Merit Badge costs 10,000 "Gift Points" 1 each time you want to give one to another member. Click on a Merit Badge above to see a few virtual examples. How do I send a physical Merit Badge? 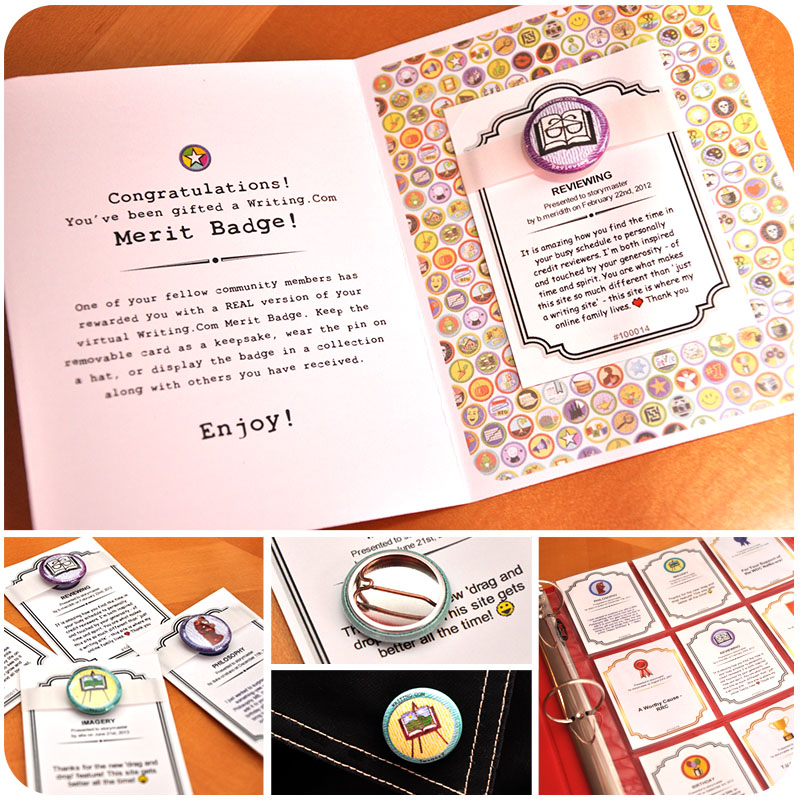 When you give a virtual Merit Badge, you also have the option to gift a physical badge that will be sent to the member by USPS First Class mail. The member will receive your gifted Merit Badge in the form of a 1" button pin attached to a keepsake card (see photos below). The pins can be displayed as a collection or worn individually. The cards are standard sports-card size, so that they can be kept in a collection of sleeves. Each physical Merit Badge costs 25,000 "Gift Points" 2 each time you want to send one to another member. Click on the photo above to see examples of the physical badges. To whom should I give a Merit Badge? Merit Badges should be given to any Writing.Com member whom you would like to recognize for any reason. Is there someone you feel has excelled in a certain genre or a type of writing? Has a member supported you through his or her words or actions? Do you see someone participating in the community and want to recognize his or her efforts? No reason is too trivial; all members appreciate positive recognition for whatever reason! Merit Badges are also a great way to reward members who have excelled in a project or fulfilled their requirements in a group. They are great to use as prizes in a contest; reward the winning authors with Merit Badges and their items with "Awardicons" ! Why should I give a Merit Badge? Merit Badges received by a member count toward his or her "Community Recognition" , which is the number located after that member's handle.Therefore, you are not only handing out a visual badge of recognition for that member to display, you are also helping a member build his or her presence within the community. How can I view a member's Merit Badges? Clicking on a member's Community Recognition number will launch a window containing a summary of merit badges that he or she has received. Merit Badges also reside on an author's "Community Tab" within a member's portfolio and may be viewed by the public as long as that account exists. As "Awardicons" are awards for individual items, Merit Badges are awards for the authors themselves! Is there an easy way to tell which Merit Badges a member does not have? To view a member's Merit Badge Checklist page, left click the member's handle menu, click on Badges and at the top right of that page, click on View Checklist under Send a Merit Badge. Or you can find the View Badge Checklist link on the member's Community tab under the Merit Badge Summary list. In the Merit Badge Checklist page, a Give it! link is shown beside the Merit Badges you are able to give, which the member doesn't already have. Clicking on a Give it! link opens the Merit Badge Shop page with that Merit Badge selected and the member's name pre-loaded in the order form. How many Merit Badges may I give out? There is no limit on the number of Merit Badges you may give out to other members. However, only one given Merit Badge per member per 14 day period counts toward a member's Community Recognition. How many Merit Badges can I collect? 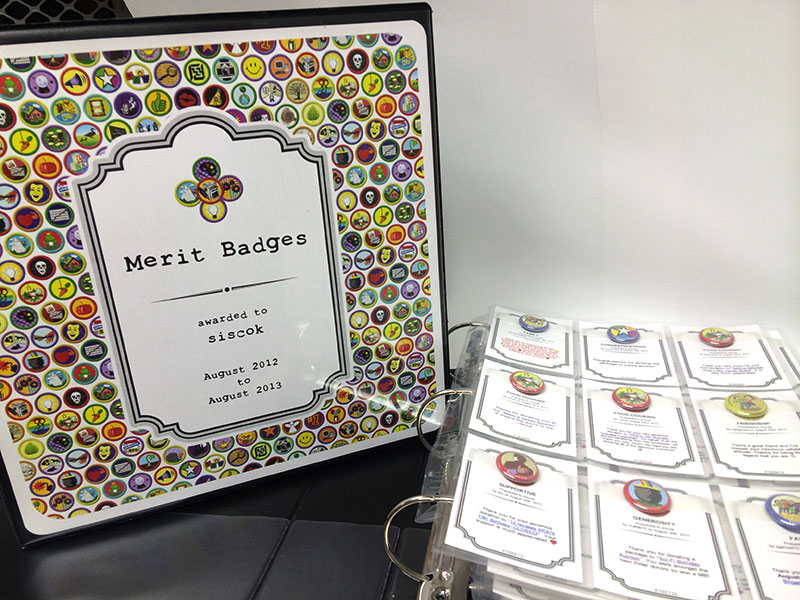 There is no limit on the number of Merit Badges you can receive from other members. However, only one received Merit Badge per member per 14 day period counts toward your Community Recognition. Where will my virtual Merit Badges be stored? How can I find them? You can quickly access a complete summary of your Merit Badges by clicking the Community Recognition number located next to your handle. Using this method, Merit Badges can be viewed individually by topic or as an entire collection. All of your Merit Badges will also be stored and available from within your portfolio. To view your collection from within your portfolio, just head to your portfolio and click the "Community" tab. Visitors to your community recognition and portfolio will also access your Merit Badges from these same links. Can I display Merit Badges in my signature? Yes, by using WritingML, you can quickly and easily add a Merit Badge (or more) to your signature. Please read WritingML Help for badge. No, you may not download the Merit Badges. Each Merit Badge is owned by Writing.Com and may not be used for personal use. There are many tools provided for displaying them without having to actually download or manipulate them in any way. Where can I view all of the Merit Badges that have been given out within the community? Where can I view all of the Merit Badges that I have given out to other members? Can I give Merit Badges to Groups? No, groups are items and items must be rewarded with "Awardicons" . Can I give myself a Merit Badge? No, Merit Badges may only be given to other members. Can I request a new Merit Badge design? Yes, you may commission (guarantee) new badges using: "Commission a Merit Badge"
Alternatively, you can make a request for a new badge design using: "Costumicon/Merit Badge Requests"
Will my mailing address be made public to other members when they send me a physical merit badge? No, your mailing address will always be kept private and only used by the system to generate a mailing address when your physical badge is assembled and shipped. Only Writing.Com Staff will see this information. Can you ship a physical merit badge for a virtual one I've already given to someone? Yes! Visit your "Given" badge area and click on the one you want to order for the member. From that window, click the Order button at the bottom and we'll take care of the rest! Can I order physical Merit Badges for ones I've already received? Yes! If you would like to order a physical Merit Badge for one that you've received, visit your Merit Badge area and click on the badge. From the window, click the Order Physical Badge button at the bottom. How can I display my physical merit badges and awardicons? 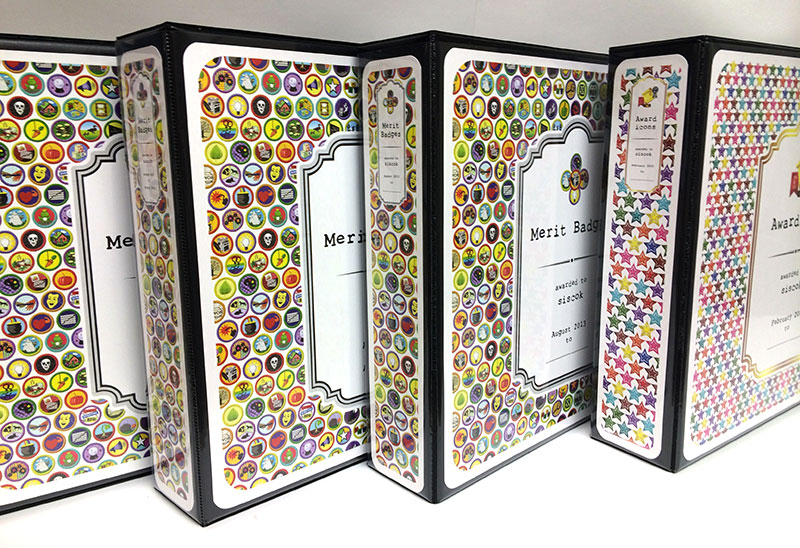 In our shop, you'll find the perfect binder that will house your keepsake cards, merit badges and awardicons. The cover and spine allows for you to personalize with your username, volume number or dates. Keep your physical merit badges and awardicons in our official Writing.Com binders designed specifically for them! 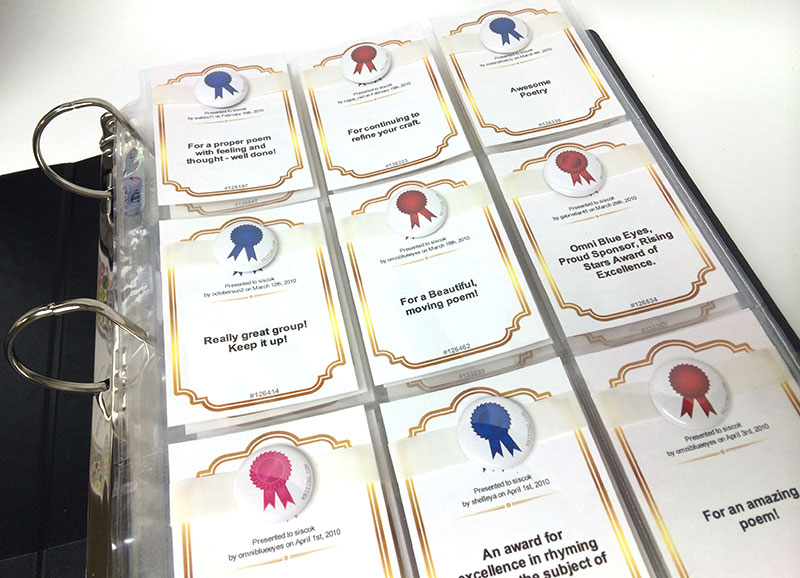 If you are interested in ordering all of your previously-received badges and awardicons in bulk instead of individually (minimum 50), email The StoryMistress to discuss the options and price. Since we would be assembling them all at the same time and shipping them to you as a package, we would offer them at a discount, dependent on how many you've received. Each merit badge and awardicon will be assembled and packaged in chronological order in black or white binders then shipped directly to you. We take care of the work and you can continue your collection with new ones! Click to view examples of ~ Sisco ~ 's collection. Can we gift a member his/her bulk order of badges and awardicons? Absolutely! If you are interested in gifting another member his/her entire physical merit badge and awardicon collection, email The StoryMistress to find out the specifics. This is a great gift for one friend to another or for a group to come together to honor another member or even as a prize in a contest! How long will it take for the physical Merit Badge to arrive? Does a physical Merit Badge affect community recognition? No, a physical Merit Badge does not count toward community recognition at all. Can I send a physical Merit Badge without sending a virtual one? When you order a physical Merit Badge for a member, the system will automatically email him or her to request a physical mailing address. Members have up to two weeks to supply their accounts with a current mailing address. After this time, if no address has been input, the system will refund your Gift Points and no physical Merit Badge will be mailed. I received an email that someone gifted me a physical Merit Badge, but it hasn't been delivered by USPS yet. Now what? To keep costs affordable for everyone, we mail physical Merit Badges by USPS First Class Mail. Since this method is inexpensive, it does not include tracking or delivery confirmation. Once your Merit Badge order leaves our hands, it is in the hands of the postal system. If you would like to reorder your Merit Badge, choose the badge from within your Merit Badge page and click the Reorder Physical Badge button at the bottom. 1 The price for a new Merit Badge is subject to change without notice. 2 The price for a physical Merit Badge is subject to change without notice. Generated in 0.56 seconds at 7:11pm on Apr 18, 2019 via server S30.